Spoiled rich people have been awful for centuries and our theatre, literature, and film has been reminding us of this fact with regularity. 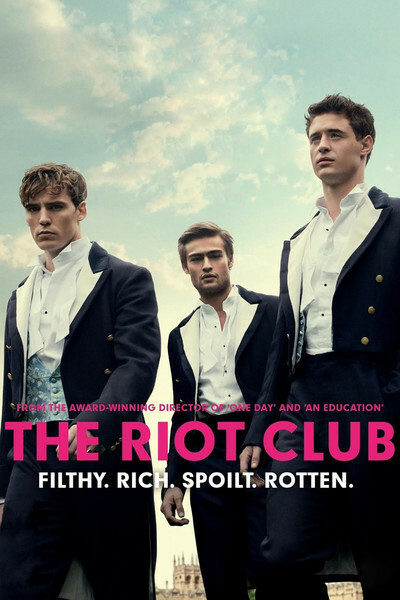 To this pile of moralizing fiction about the soulless elite, we can now add Lone Scherfig’s “The Riot Club,” adapted from the play “Posh” by Laura Wade by the author herself. The play caused something of a stir when it premiered in 2010, in no small part because it was deemed to be a commentary on the actual Bullingdon Club, an all-male “Briternity” if you will, of men behaving badly. The immediacy of real-time, horrendously escalating behavior on a stage does not make the transition smoothly to film, partially because we’ve seen stories like this so often before but also because of tonal and pacing mistakes made by Scherfig and a cast of overly similar young men who start to blur together. It’s also a film with a muddled message in that it places these raucous, intellectual, smart people on a pedestal and then wags a finger at the audience for ever liking 90% of them. It’s a film that seems to have no further point than to remind us that some powerful jerks were once powerful jerk kids. Point taken, but it’s not cinematically satisfying. For a long first act, Scherfig and Wade depict this motto in vivid color. The initiation of Milo and fellow new member Alistair (Sam Claflin) plays like a hundred fraternity pledge weeks we’ve seen in American cinema down to the vandalism of their rooms and the forcing them to ingest bodily fluids. They run around Oxford saying annoying things like “totally f**king legend” and we wait for the inevitable turn. Will these bad boys get their comeuppance and realize the error of their ways? Milo is clearly set up as the only one with a conscience while Alistair is his opposite, a young man whose brother was a legendary Riot Club member and he has big, gross shoes to fill. It all builds to the actual adaptation of the play, which comes about 45 minutes in and takes place in a dinner club that the boys have rented for the night as a party to celebrate Milo and Alistair’s induction. They take over a back room, and one can tell that the seeds of resentment, jealousy, and classism that Wade has planted are about to be watered. The introductory act and this centerpiece of the film feel like different projects. The characters, the class issues, the narrative purpose is more distinct. Still, the message of the film remains muddled even as vile words give way to despicable actions. We are meant to like Milo basically because he has a girlfriend and hesitates, only slightly, in the face of committing heinous activity. It’s a thinness of character that feels about as superficial as any of the Riot Club member’s choices. And too much of the behavior, especially in the first hour, is portrayed as glamourous. These are beautiful people doing outrageous things and the turn toward real darkness in the final act feels manipulative more than organic. To be fair, there are some strong performance here by the two gentlemen given real characters (Irons & Claflin…the rest truly blur together, making one of their victims' assertions that he couldn’t tell them apart a bit of self-criticism on the film) and Grainger. And Scherfig gives a few sequences the right degree of righteous indignation at the behavior of boys who know they can pay their way out of any immorality. It’s just not enough to justify the journey into the immorality that resides in the educational history of many of the world’s power players. Yes, powerful young jerks become powerful adult jerks and there’s little justice to it all. It's a tale as old as time, and the telling here isn't engaging enough to hear it again.